The General Electric/Allison J35 was originally developed by General Electric (GE company designation TG-180) in parallel with the Whittle-based centrifugal-flow J33, and was the United States Air Force's first axial-flow (straight-through airflow) compressor engine. The J35 was fairly simple, consisting of an eleven-stage axial-flow compressor and a single-stage turbine. With the afterburner, which most models carried, it produced a thrust of 7,400 lbf (32.92 kN). Like the J33, the design of the J35 originated at General Electric, but major production was by the Allison Engine Company. While developing the T31 axial turboprop in 1943 GE realized that they had the resources to design an axial turbojet at the same time as their centrifugal J33 engine. They recognized the axial would have more potential for the future and went ahead with the TG-180 engine. GE axial compressor designs were developed from the NACA 8-stage compressor. Allison J35 (GE), 1947 (National Naval Aviation Museum, Pensacola, FL). The engine had its starter and accessories (fuel control, fuel pump, oil pumps, hydraulic pump, RPM generator) mounted in the centre of the compressor inlet. This accessory layout, as used on centrifugal engines, restricted the area available for compressor inlet air. It was carried over to the J47 but revised (relocated to an external gearbox) on the J73 when a 50% increase in airflow was required. It also had an inlet debris guard which was common on early jet engines. 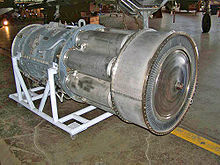 GE developed a variable afterburner for the engine, although electronic control linked with engine controls had to wait until the J47. Marrett describes one of the consequences if the link is human on an afterburning engine. If the afterburner lit but the nozzle didn't open (not noticed by the pilot) the RPM governor would overfuel the engine until the turbine failed. The General Electric J35 first flew in the Republic XP-84 Thunderjet in 1946. Late in 1947, complete responsibility for the development and production of the engine was transferred to the Allison Division of the General Motors Corporation and some J35s were also built by GM's Chevrolet division. More than 14,000 J35s had been built by the time production ended in 1955. The J35 was used to power the Bell X-5 variable-sweep research aircraft and various prototypes such as the Douglas XB-43 Jetmaster, North American XB-45 Tornado, Convair XB-46, Boeing XB-47 Stratojet, Martin XB-48, and Northrop YB-49. It is probably best known, however, as the engine used in two of the leading fighters of the United States Air Force (USAF) in the 1950: the Republic F-84 Thunderjet and the Northrop F-89 Scorpion. A largely redesigned development, the J35-A-23, was later produced as the Allison J71, developing 10,900 lbf (48.49 kN) thrust. 3,820 lbf (16.99 kN) thrust, prototypes built by General Electric. 3,820 lbf (16.99 kN) thrust, production by Chevrolet. 4,000 lbf (17.79 kN) thrust, production by Chevrolet. Wikimedia Commons has media related to Allison J35. ^ Gunston, Bill (2006). The development of jet and turbine aero engines (4 ed.). Sparkford: PSL. p. 143. ISBN 0750944773. ^ Dawson, Virginia P. (1991). "SP-4306 Engines and Innovation: Lewis Laboratory and American Propulsion Technology Chapter 3 : Jet Propulsion: Too Little, Too Late". history.nasa.gov. Washington, D.C.: National Aeronautics and Space Administration Office of Management Scientific and Technical Information Division. Retrieved 16 March 2019. ^ "AERO ENGINES 1956". Flight and AIRCRAFT ENGINEER. 69 (2468): 567–597. 11 May 1956. Retrieved 16 March 2019. ^ "Aero Engines 1957". Flight and Aircraft Engineer. 72 (2531): 111–143. 26 July 1957. Retrieved 16 March 2019. ^ General Electric Company. Seven Decades of Progress: A Heritage of Aircraft Turbine Technology (1st ed.). Fallbrook: Aero Publishers Inc. p. 76. ISBN 0-8168-8355-6. ^ Marrett, George J. (2006). Testing death : Hughes Aircraft test pilots and Cold War weaponry (1st ed.). Naval Institute Press. p. 21. ISBN 978-1-59114-512-7. ^ Wilkinson, Paul H. (1953). Aircraft engines of the World 1953 (11th ed.). London: Sir Isaac Pitman & Sons Ltd. pp. 60–62. ^ Bridgman, Leonard (1955). Jane's all the World's Aircraft 1955–56. London: Jane's all the World's Aircraft Publishing Co. Ltd.
^ Wilkinson, Paul H. (1957). Aircraft engines of the World 1957 (15th ed.). London: Sir Isaac Pitman & Sons Ltd. pp. 70–71. Kay, Anthony L. (2007). Turbojet History and Development 1930–1960 Volume 2:USSR, USA, Japan, France, Canada, Sweden, Switzerland, Italy and Hungary (1st ed.). Ramsbury: The Crowood Press. ISBN 978-1861269393. "Foremost American Turbojet : Some Details of the Slim, Axial-flow J-35". Flight and AIRCRAFT ENGINEER. LIV (2067): 163. 5 August 1948. Retrieved 16 March 2019.